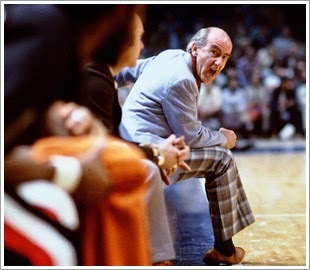 With the passing of Dr. Jack Ramsay, I took the opportunity to read of my notes from one of my favorite books, "The Coach's Art" written by Coach Ramsay. It is a timeless book that still holds tremendous advice for coaches on all levels. This is Part iI or two parts from only one of the chapters in the book titled: "The Team Game." The philosophy determines every aspect of practice, the objectives of meetings, and finally the game plan. It is the cement which binds every activity of a coach and his team, linking practice drills to game performance. The preparation of a team begins with planning practices for it is on the practice floor that teaching the game occurs. The importance of planning practices can’t be overstated. A practice session’s objectives, expressed in a practice plan, must be determined in advance – and in detail. I invariably schedule defensive drills first. It’s a small way to impress upon the players my belief that defense, as the key to team success, comes first. The drill work at practice, whether on offense or defense, is always made up of components of our defensive or offensive pattern. It’s important to break the game down into its basic parts, explaining the significance of each, and then drill, drill, drill. Once the components have been mastered, they can be fitted into the whole. The tedium of repetition can interfere with learning. Fatigue affects concentration, and players need to have their full attention on what they’re doing. Players like organization, they like order, they will work hard when they see the purpose of what they’re doing. When every player knows what’s expected of him and why, practices will be productive. And then even hard, physically demanding sessions will be fun, building the sense of common purpose and collective affection every good team has. When players and coaches feel good about what’s happening in practice, they will carry that spirit with them into games. I want every practice well organized, productive and conducted with the same intensity and commitment as a game is played. A coach who allows players to depart from his plan at practice can expect the same thing in a game. Just as drills are the basic part of a team’s game, its style of play, practices, too, must reflect other demands a team will encounter in games. Teaching pace, an awareness of time and the significance of the clock, the importance of officials and score differentials, are all also a part of what practices must prepare for. The preparation of a game plan begins with a study of the opponent’s style of play, it’s strengths and weaknesses. This analysis is a critical part of coaching. If an assessment of an opponent is inaccurate, the game plan will be inadequate. A sound appraisal can’t be made from watching a team play only once. The object of any game plan is to limit an opponent’s opportunities to do what it does best, while carrying out one’s own style of play. 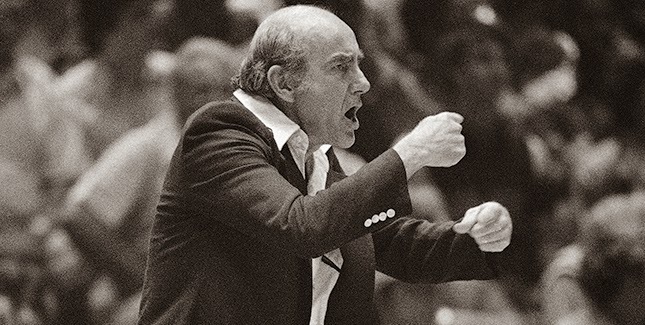 With the passing of Dr. Jack Ramsay, I took the opportunity to read of my notes from one of my favorite books, "The Coach's Art" written by Coach Ramsay. It is a timeless book that still holds tremendous advice for coaches on all levels. This is Part I or two parts from only one of the chapters in the book titled: "The Team Game." Coaching is a means of self-expression. Successful coaches, like artist, have a characteristic style. No coach lacking a firm sense of what he wants to accomplish through his team can succeed. A coach’s personality, and hence the character of his team, is reflected in his philosophy of the game. There are no original ideas left in basketball. Determining his philosophy is, therefore, a coach’s primary task; he must decide, before anything else, what it is he wants to say of himself through the game. A coach’s style will evolve. Simply imitating the style of a successful coach is not the same thing as determining one’s own coaching philosophy. Good coaching begins with self-scrutiny, which, in turn, leads to a selection of a playing style. No team can win in any sport without skillful athletes. Desire along can’t substitute for talent. A highly motivated player with insufficient talent just can’t do the job, no matter how hard he tries. However, a highly skilled but poorly motivated player can, with proper coaching, learn to integrate his skills into a team’s overall style of play. The best attitudes in the world won’t help win ball games if they’re not accompanied by fundamental competence in the game. Though they may play fewer minutes, the bench players are no less significant to the team than the starters. Each player has personal needs to which the coach must be sensitive. Setting attainable goals for each player is an essential part of good coaching. 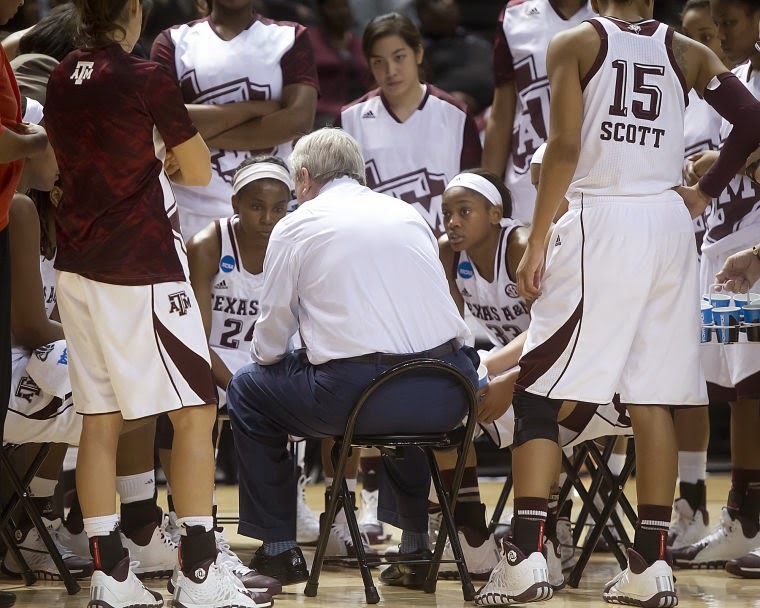 Players need to know exactly what’s expected of them, both at practice and during games. Defining the responsibilities of each position, and drilling the players in them, helps set reasonable goals. A player who neither knows what is expected of him nor has had an opportunity to practice his position can’t perform well. I don’t think personal goals beyond meeting the responsibilities of one’s playing position have much meaning in basketball. Even high figures in apparently unselfish statistical categories can be misleading. What finally matters is who wins and loses. And if we win, the team statistics will come out right. When we do play well, I want the players to know that their efforts are appreciated. I will praise them privately, before the team or in the press. We all need a little recognition when we do something well. It’s important to every player well. I have many conversations with each player during the season. It may be in an airport or on a bus, or in a hotel coffee shop. In the course of a long NBA season, every player will make a significant contribution at one time or another, but keeping players ready who are seeing little action is not always easy. Part of keeping a player ready is simply explaining to him the role he has one the team. A good bench player knows what he’s supposed to do and why he’s doing it. How to I keep the bench players ready? I include everyone player in every game plan, first of all, reviewing the assignments and match-ups as thoroughly for the substitutes as for the regulars. I also give the short-minute players extra attention in practice, working with them to improve their skills. In practice the day after a hard game, particularly, the players who played least know they’ll have the hardest workout. Coaching is a private act sometimes performed in public places. Coaching in a game is only part of the job, but it’s the part that finally counts the most. I hate to lose, but I know that one a game is over I have to put it out of mind in order to prepare for the next one. 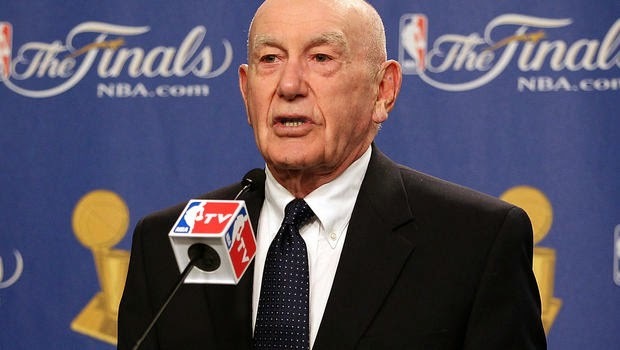 We want to take this opportunity to send along our wishes to the family of Dr. Jack Ramsay who passed away this morning at the age of 89. 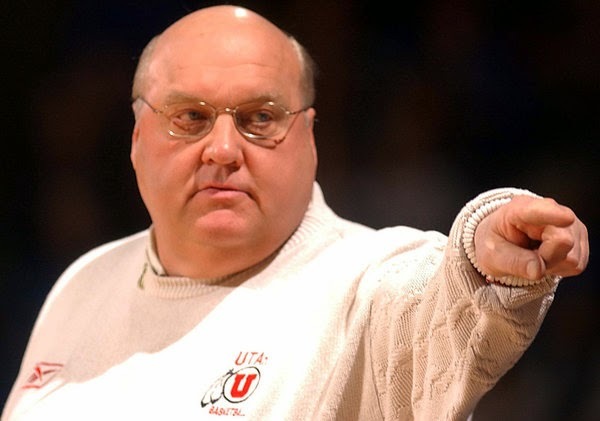 His defensive philosophy inspired Red Holzman to get into coaching. His high powered offensive attack was copied later by Pat Riley and the Showtime Lakers. In fact, Bill Walton said that on the top of the blackboard for every pre-game instruction was always the same phrase "RUN - RUN - RUN." 1. Basketball, like every other sport, is predicated on the execution of the fundamentals. 2. The coach is a teacher; his subject is the fundamentals. 3. The highest level of achievement is attained by the teams with the best conditioned players. 4. Even the greatest players have a level of improvement to achieve. 5. Even the greatest players accept coaching and value the need for discipline and the order that it brings to the team. 6. Winning is more related to good defense than good offense. 7. Break-down drills, under simulated game conditions, are essential to team success. 8. Teams that play together beat those with superior players who play more as individuals. 9. There are no physical limits to individual achievement. 10. Although the game has become more sophisticated, simpler is better in developing and teaching a system of play. 12. Teams that never concede defeat can accomplish incredible victories. I came across an interview between Swish Appeal and Tyler Summitt, the new head coach at Louisiana Tech. 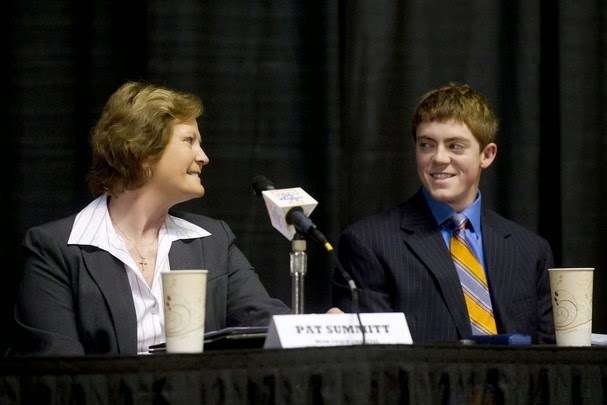 As we all know, Tyler is the son of Coach Pat Summitt. Because of this, I loved the question posed to Tyler and loved even more his answer. SA: Out of the all the things you have learned from your mother, what is the one thing that stood out the most? TS: "I think it's character, it's doing things the right way. My mom never cut corners; she always did things right way, treated people the right way. And at the same time, she held people accountable, I don't care what they were doing, they were held strictly accountable to be the best they could be. "But at the same time, she always did things the right way. She just had (great) character on and off the court, everything she did. So, I'm going to strive to have character as well." Tyler obviously had a great teacher in Coach Summitt but he was obviously a great learner -- understanding it goes well beyond X & O's. 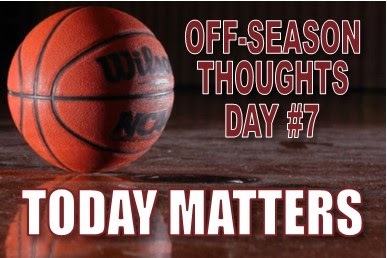 OFF-SEASON THOUGHTS -- DAY #7: During this 10-day period, we are going to load up our blog on thoughts that are relevant to developing or improving your off-season program. We will delve on off-season topics from player development and drill work to motivation and team building. It will be our sincere wish that over the next 10 days we can provide you with at least one item or thought that will help you and your program. A part of summer has to be the improvement of strength and conditioning. I have been blessed to have coached at some places with some outstanding performance coaches including Jen Jones here at Texas A&M. What the best do is that they work the student-athletes in a fashion that they can enjoy that work as much as possible. A big key is coming up with new and fresh ideas. It is difficult for today's athlete to maintain good energy with a monotonous, daily, regimented workout -- whether its on the basketball court, in the weight room or out on the track. Jen is always coming up with great ways to get our strength, speed and explosiveness developed. It's why I enjoyed this video of Florida's men's basketball team and their Summer Strongman Competition. Below is J.J. Redick going through a series of shots he likes to work on when facing a closeout situation. He has five that he works from in his shooting workout. The question is, what shots are your players working on in the off-season. Don't assume they know what they need to be shooting. GAME SHOTS: Give your players the shots they need to hit for you as it relates to how you play offensively. I was impressed that Redick had a routine for attacking closeouts. Have a plan of what is important to your offensive success and work your off-season program around that. GAME SPEED: You players must know that game shots much be at game speed. Be quick, but don't hurry. Using a stop watch or clock can assist in creating a sense of urgency. TECHNIQUE: Make sure you give them one simple teaching point for the drill that will help them with better execution. They don't need a huge laundry list to follow -- because they won't. MEASURE: A method of measuring makes is important. The ability to chart improvement will help with their motivation. FORM SHOOTING: While game shots at game speed are important, players should find time for basic form shooting to reinforce the fundamentals of their basic shot. OFF-SEASON THOUGHTS -- DAY #6: During this 10-day period, we are going to load up our blog on thoughts that are relevant to developing or improving your off-season program. We will delve on off-season topics from player development and drill work to motivation and team building. It will be our sincere wish that over the next 10 days we can provide you with at least one item or thought that will help you and your program. From my days at LSU, I have always had a list of guidelines for our team to follow in pick up. Let's be honest: pick will rarely if not never be a thing of beauty. There is no atmosphere more conducive to slippage than that of players playing without supervision from a coach. To me, there are four things needed for successful pick up play. As a coach, you must paint a picture of what good pick up will be and what it will achieve. For us, a good game of pick up has energy and enthusiasm. It is a group of players that enjoying playing with each other and playing the game of basketball. It is also a noisy proposition. Lots of talking and chattering. Players are talking the game. They are encouraging each other and holding each other accountable. Good pick up basketball has leaders that get things going. It's time to play -- let's get it! 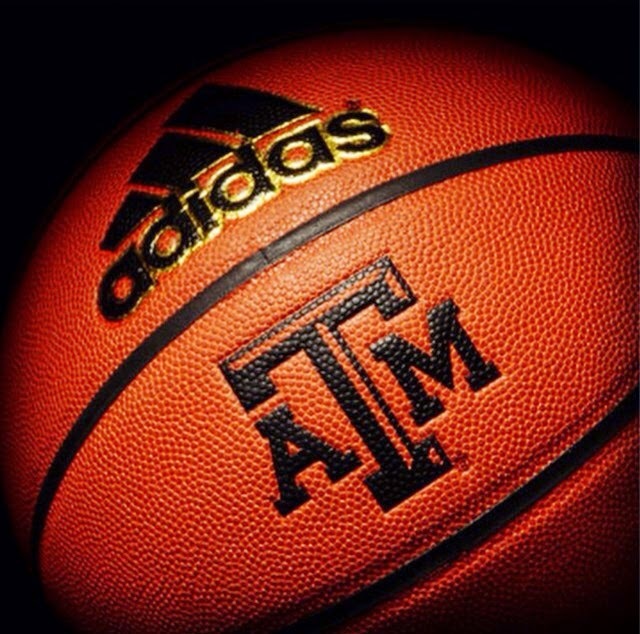 They have a sense of urgency -- here's out teams...Maroon ball...let's go! They play hard and smart -- they set a visual example. They encourage and correct their teammates. They are the eyes, ears and mouth of the coaching staff. Good pick up basketball has a team that is committed to improving. They understand that every time they step on the court they will either get better or get worse. Teams that get better during the summer are holding each other accountable for effort and execution in pick up games. I've always believed that a good set of guidelines can help a great deal. The team is "navigating" through the summer without you but you can provide a "road map" with some good guidelines. "WHAT HAVE YOU DONE THIS SUMMER?" OFF-SEASON THOUGHTS -- DAY #5: WHAT IS YOUR EMPHASIS IN OFF-SEASON PICK UP GAMES? OFF-SEASON THOUGHTS -- DAY #5: During this 10-day period, we are going to load up our blog on thoughts that are relevant to developing or improving your off-season program. We will delve on off-season topics from player development and drill work to motivation and team building. It will be our sincere wish that over the next 10 days we can provide you with at least one item or thought that will help you and your program. A key part of off-season development is pick up games. Most coaches are great to organize their pick up games by scheduling the gym time for the team. Maybe even helping establish teams. However, what can you to maximize the time spent by your team when they are playing without your watchful eye upon them? 2. On catch, put your nose on the chest, force dribble, and level him off. 3. Stance = On ball, Denial, Help. What are you going to ask of your team when they are playing this summer? OFF-SEASON THOUGHTS -- DAY #4: During this 10-day period, we are going to load up our blog on thoughts that are relevant to developing or improving your off-season program. We will delve on off-season topics from player development and drill work to motivation and team building. It will be our sincere wish that over the next 10 days we can provide you with at least one item or thought that will help you and your program. "A player who refuses to accept her role will be unhappy, and usually ends up transferring. I also tell them that if they don't like their role, then they should use the summer to change it." I think this is critically important. Players don't have to accept a current role as permanent. They need to know that consistent, deliberate work in the off-season can add to their game and thus expand their role. The thing that has to happen though is the communication of this concept from the coach. Year-end meetings are necessary to help give a player motivation and vision for the off-season. It must be communicated to the player exactly how you see her/his game. Never assume they know how you feel -- that is a recipe for disaster. Let them know what they did well and where they need to improve. The next step is to give them a blueprint. Be very detailed in the areas you want them to improve and be specific and how they can improve. We give our players summer booklets that detail what we want them to work on including specific drills for them to use. Each book is created individually to meet the needs of that particular student-athlete. "Great players work more individually outside of practice than the average players. The really great players are the ones who come in early, stay late, and come in on their own. Beth Morgan, Ruth Riley, and Katryna Gaither are examples, and it's obvious why they were the best players. They knew their weaknesses, and they worked on those weaknesses. We've had good players who came in and worked hard in practice. But after those two hours are over, they leave. The only way you can improve as a player is by what you do on your own. To that extend, I believe that players are made over the summer. If you put the time in over the summer, when the coaches aren't allowed to be there, that's when you really see the improvement. It's very evident who put in the extra effort." What I liked about Coach McGraw's passage above is that she called out the names of the players on her team that had excelled in the off-season. As a coach, it's important that you acknowledge those that are dedicated in the off-season. First, because they have earned your compliment. And second -- and more importantly -- that you let your entire team know that you as a coach recognize those that are putting in the work. "At the end of the season, we begin preparing practices for the next year. We review our offenses and defensed. We watch a lot of game film. Then we try to decide, based on which players will be returning, what will work and what won't next season. We might talk about introducing new things depending upon our personnel. It's important to do this because we can spend the summer learning. We visit coaches and go to clinics. If we think we'll be able to press in the upcoming season, for example, I'll assign an assistant coach to go visit Rick Pitino to learn more about presses. In other words, for coaches, summer is for homework." 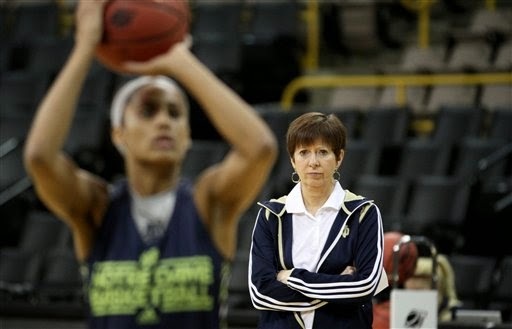 Again, the obvious approach of Coach McGraw and her staff in the summer is to work and continue to improve. But the other positive effect to this is that her players see that the coaches are dedicated to off-season growth as well. There is a reason that continuously successful programs continue to be successful -- it's a year-round occupation!